Beatrice Fihn, executive director of the International Campaign to Abolish Nuclear Weapons and Daniel Hogsta, coordinator, celebrate after winning the Nobel Peace Prize 2017, in Geneva, Switzerland Friday. GENEVA - With the nuclear threat at its most acute in decades, the International Campaign to Abolish Nuclear Weapons, which on Friday won the Nobel Peace Prize, is urgently pressing to consign the bomb to history. The Geneva-based organisation, known by the acronym ICAN, has for the past decade been sounding the alarm over the massive dangers posed by nuclear weapons and campaigning for a global ban. It secured a significant victory in July this year when the United Nations adopted a new treaty outlawing nuclear weapons. But with actual disarmament of the world's nuclear arsenal likely still far off, ICAN is not resting on its laurels. "We're not done yet? The job isn't done until nuclear weapons are gone," ICAN chief Beatrice Fihn told AFP this week. Pointing to the current nuclear standoff between Washington and Pyongyang as "a wake-up call", she insisted on the urgent need to disarm the world's 15,000 or so nuclear weapons. "Nuclear weapons have the risk of literally ending the world," added the Swedish national, who took charge of ICAN in 2014. "As long as they exist, the risk will be there, and eventually our luck will run out." 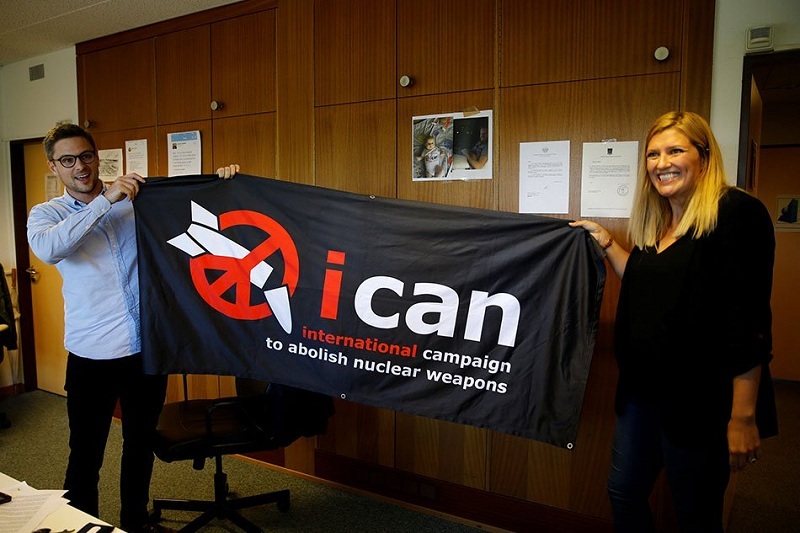 Founded in Vienna in 2007 on the fringes of an international conference on the nuclear non-proliferation treaty, ICAN has tirelessly mobilised campaigners and celebrities alike in its cause. From its offices in the buildings of the World Council of Churches in Geneva, ICAN works with 468 non-governmental organisations across 101 countries, including rights, development, environmental and peace groups. A decade ago, the anti-nuclear movement was fragmented, Fihn said, explaining that ICAN was created to help a vast array of groups push for a ban similar to the global agreements forbidding the use of biological and chemical weapons, landmines and cluster munitions. Those efforts paid off in July this year, when 122 countries at the UN adopted the new treaty banning nuclear weapons, despite harsh opposition from the United States and other nuclear powers. "It is really a landmark achievement," Fihn said, acknowledging though that the adoption of the treaty was merely "a starting point". None of the nine countries that possess nuclear weapons -- the United States, Russia, Britain, China, France, India, Pakistan, North Korea and Israel -- took part in the negotiations. And the treaty will only enter into force when 50 countries have signed and ratified it, a process that could take months or years. But while there is no way as of yet to force nuclear powers to disarm, Fihn voiced optimism that the treaty declaring them illegal would help stigmatise them. "The more countries we can rally to reject nuclear weapons and the more public opinion changes to think that this is unacceptable, the harder it is going to be for the nuclear-armed states to justify it," she said. "Once it is prohibited, these weapons are on the way out," she added. ICAN argues that any use of nuclear weapons would lead to catastrophic consequences for which there could be no effective humanitarian response, and so eliminating them is the only way to prevent their use. The organisation points out that, given the power that has been added to these weapons, "a single nuclear warhead, if detonated on a large city, could kill millions of people, with the effects persisting for decades." Spending on nuclear weapons across the nine states that have them exceeds $105 billion a year -- money that ICAN says would be better far spent on healthcare, education and disaster relief. The organisation today gets by on an annual budget of around $1 million and is funded by private donations as well as the European Union and countries including Norway, Switzerland, Germany and the Vatican. But while it may not have a lot of resources at its disposal, ICAN does have many of the world's famous and powerful championing its cause. The Dalai Lama, Yoko Ono and Desmond Tutu are among those voicing support for the organisation's mission on its website. "I can imagine a world without nuclear weapons, and I support ICAN," the Dalai Lama declares. Actor and activist Martin Sheen meanwhile suggests in his quote that "if Gandhi and Martin Luther King Jr were alive today, they would be part of ICAN." With the nuclear threat at its most acute in decades, the International Campaign to Abolish Nuclear Weapons, which on Friday won the Nobel Peace Prize, is urgently pressing to consign the bomb to history.